Madness Monday – Gambling in Vegas… on Diplomas? In December 2010 I was wandering rather aimlessly through a random antique shop in Las Vegas, Nevada while on a trip with my mother-in-law, Karen. At the end of a narrow hallway stood an old hutch filled with family photographs and memorabilia. I have a fascination with the story behind old photographs and immediately started thumbing through what was there. 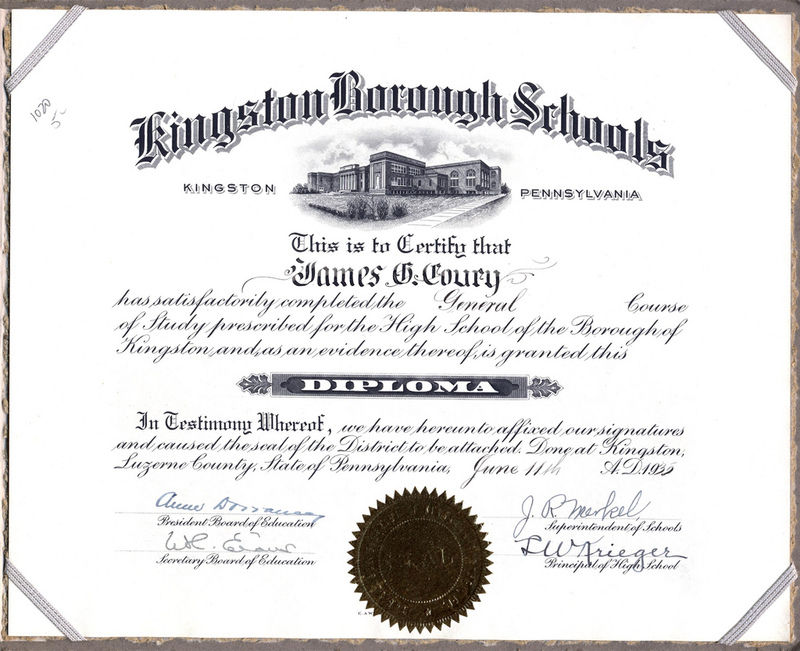 I quickly noticed an old diploma for a gentleman named James G. Coury from Kingston Borough Schools in Kingston, Pennsylvania. I don’t really have any family from Pennsylvania, nor had I ever heard of Kingston before. Something struck me about the grandeur of this particular piece. It was in its original paper frame and was in perfect condition, as if it had been stored away for a long time. The date on the document was June 11, 1935. I picked it up and immediately noticed that directly behind it were three more diplomas from the same school. In fact, I was a bit surprised to realize they appeared to be from the same family: Peter Anthony Coury (June 1943), Janette Mary Coury (June 1948) and Cecilia Ann Coury (June 1951). My gut sank like a bottomless pit, and something told me there was a problem with this situation. I couldn’t believe that these diplomas were all sitting here, together, from the same family and the same school, inconspicuously priced at $5.00 each. At the surprise of my mother-in-law, I decided to purchase the diplomas. I felt like I was up to the challenge of finding an ancestor from this family. There had to be more to this story. I took the four diplomas up to the front counter. The shop owner just looked at me like I had three heads. She asked me why I wanted to buy them. I told her I was a volunteer genealogist and I wanted to try to return them to the family. She said, in a very direct manner, that I was wasting my time and my $20.00. She told me that nobody wants them, that’s why they were thrown out. She was incredibly rude to me and left me feeling very angry. She was running a business, why did she care what I did with the stuff I bought from her? I recall standing in the parking lot and taking a good look at the front of the building, thinking to myself that I never wanted to return to her shop. On December 11, 2010 I returned home to Phoenix and hopped on Ancestry.com. It took me all of about 30 seconds to locate a researcher online who had these four siblings in a family tree. I quickly sent a message and asked how this person was related to James, Peter, Janette and Cecilia. I said that I had found something they might be interested in for their family archives. I then waited patiently. I see that you have the family of Anthony and Minnie Coury in your tree – specifically the children James G. Coury, Peter Anthony Coury, Janette Mary Coury, and Cecilia Ann Coury. I am looking for someone with close ties to these family members. Can you tell me how you are related to them? My husband is the son of Viola Teresa Coury. She is the sister of James, Peter, Janette and Cecilia. They also had another brother Albert. Let me know if you have any other questions. I would love to help out. And if you could help me out too that would be great. I have had a really difficult time finding information on the Coury side of the family. That is so great that you found those! We knew my husband’s aunt had died in 2009. They actually had a burial ceremony for her in PA. Her 2 sisters that are the only living siblings left, are my husband’s mother, Viola and his aunt, Janette. They both live together in PA. They are older, in their 80s, and couldn’t go to Las Vegas to oversee anything that was going on in regards to her house and belongings. They sent my husband’s 2 cousins out there to see what they could do. So… I guess what they did was get rid of everything instead of really taking the time to go through her stuff. That’s sad. We would love to have the diplomas if you are willing to send them to us. I know her sisters would be delighted to see them. I am so happy you cared enough to not see them rot away like they were clearly going to do. If you do return to the antique shop, pictures would be great if you can find any. Like I said, we have had a really hard time finding any information on the Coury side of his family. I do know that his Aunt Cecilia was a bit of a pack rat, so there is probably a lot of stuff there that is just not worth saving. I just wish they would have gone through some things instead of just throwing them out with the trash. Thank you so much for doing this. We really appreciate it. I got the diplomas in the mail today! Thank you so much. I always wanted to quickly tell you that my husband spoke to the woman who owns the antique shop via email. She told him that she has no idea what we are talking about. She doesn’t think it was her shop that had Cecilia’s items. She basically blew us off completely and told us that she couldn’t help us any further. So… if you are in the area and go in the shop if you could just check for pictures for us that would be great. Oh, she also said that once she goes through the boxes, anything she finds that she thinks is important she contacts the family members and returns the items to them. I guess she didn’t think the diplomas were important enough. Angry. That’s all I could feel towards this shop owner. She was rude to me, she was rude to the Coury family and she was just all around a mean person. She doesn’t care about the history of the items in her shop. It’s all just a way to make money. I didn’t much care to ever go back to her shop again. I didn’t want to give her any more money. I was torn between frustration towards her and the desire to help the Coury family. The next time we went to Las Vegas was July 23, 2011. I had little hope that I would be able to identify any additional belongings for the Coury family, knowing absolutely nothing about these people. I had internet access and a sense of responsibility, so I went for it. We walked back into the awful antique shop and past the horrible owner, straight to the end of the hall where I had found the diplomas seven months prior. 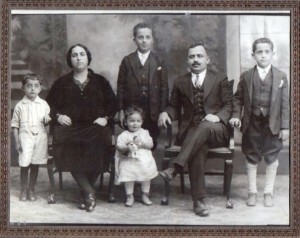 Using my Motorola Xoom tablet and my access to the Coury family tree on Ancestry.com, I began sifting through photos on the table to see if anything looked like it could have been a match. I knew the family had three boys and three girls, and they were of Italian heritage. I noticed that most of the items had a number written in pencil on them, and remembered in a flash that the diplomas also had a number. Thankfully I had scanned them in and posted them on Flickr before I mailed them out. I used the Xoom to navigate to the images on Flickr and was able to read the number “1020” in the corner. I turned back to the table and noticed the same number on a bunch of the items. I guessed that was a lot number, and my guess turned out to be correct. I’m back in Las Vegas and just went to that antique shop again. I found a whole bunch of photos that I believe might be from your family. I can’t be sure of course, but I found one military pamphlet with the Coury name and the lot number 1020 matched on all the items. The family had two parents and six children, three boys and three girls. I believe these are from your family. The shop owner was as rude as ever. I tried to bargain with her, and then I tried to plead with her, I tried to bundle everything and buy it in a lot but she was just cruel about it. I couldn’t afford everything so I picked out what I felt was most important if in fact it is your family. Family portraits, military, wedding, stuff like that. I left a few of the candid pictures of just one or two kids. The total for 9 items was $70. There were about 10 more items from the lot but I wasn’t sure if it was the same family. I took a gamble on these but what the heck, I am in Vegas right? I sure hope this is your family. I got the package today! Words cannot express how unbelievably wonderful you are! A few of the pictures have yet to be explained but we are working on them as we speak. We think they are all of our family. Absolutely fabulous! The family is thrilled. I have scanned them and sent them to everyone to remind them to always look in boxes before throwing them in the trash! You are truly fantastic! Thanks again! It just goes to show you that sometimes following your gut instinct can lead to really wonderful things. Thanks for listening to my story. I hope it inspires you to look for ways to volunteer as a genealogist. You never know how you could help a family reunite with lost treasures. My grandfather Walter Anthony Dreffs had an older brother named Vincent. At least, sometimes he was referred to as Vincent. His name changed more often than my mind did while shopping for my wedding dress. It’s like a never-ending treasure hunt for his family throughout the years. He keeps my research interesting. This is the timeline of research for Vincent’s life, and my discovery of his many alternate names. Vincent Joseph Dreffs was born January 15, 1892 in Gaylord, Otsego County, Michigan. His birth name is clearly listed in the Otsego County birth records in Michigan. His parents, like that of my grandfather Walter, were Joseph Dreffs (1866-1941) and Anna Kozminska (1867-1926). The 1900 US Census lists him as Nicck Dreffs and his entry is indexed as “Wecck Dreffe.” Unfortunately for us researchers, I think this is just a really bad case of horrible handwriting on the part of the census taker. His job was really difficult. I know for certain I would never be able to write that much if my life depended on it. It took me a few years of research to discover that Nicck and Vincent were the same boy. For a long time, I had listed them both as children in the family. The 1910 US Census index lists Vincent as “Vetsak Drafts.” I think this is another case of bad handwriting, or perhaps reflective of the family’s strong Polish accent. He is living with his parents Joseph and Annie along with his siblings Mary, Frank, Walter (my grandfather), Paul (slaughtered as “Rowel”), Andrew and Kasimer (whose nickname was Carl). This census was enumerated in Gaylord, Otsego County, Michigan on May 8-9, 1910. The story gets really interesting when you realize that Vincent and his father Joseph are actually listed in two different 1910 US Censuses. There is the first one I already mentioned where he was living with his family. Two weeks prior, he and his father Joseph are listed in the 1910 US Census as boarders in Saginaw, Saginaw County, Michigan with the family of Felix Kausfllo. Vincent is listed on this census as “Vicenty Dress” with an alternate name of “Drefs.” This census was enumerated on April 19, 1910. This makes perfect sense to me because the two of them were known to be moving around to find employment. The Saginaw census shows Joseph as being out of work for 20 weeks during the past year. I know the family was living in Gaylord for Joseph’s naturalization on September 19, 1906. I also know that Joseph and Anna had moved to Saginaw by 1915 because they are listed in Polk’s Saginaw City Directory. Vincent remained a resident of Gaylord for the rest of his life. Then, the hunt gets really fun. Vincent is listed on his marriage record to Rose Tomaski as Walter Joseph Dreffs, married on April 18, 1911. This one really threw me for a loop, considering his brother’s (my grandfather’s) name is Walter. The birth date matches for Vincent, and one of the witnesses was his brother Martin, so I’m confident this record really is for Vincent. it is possible that the transcriber wrote the name wrong. I have not requested the original record for this marriage. The next time we see a record for Vincent and Rose Dreffs is for their daughter Isabelle “Lizzie” Dreffs . She was born on June 9, 1914 and passed away on June 19, 1914 after just ten short days of life. I found this record by accident while searching on FamilySearch.org. They have so many new records that have been scanned and indexed; it is truly amazing what you can find when you’re not looking for it. The World War I Draft Card for Vincent Dreffs is surprisingly correct. The birth date matches and the draft location of Gaylord is expected. The card shows he had a wife and two children, which makes sense. The draft card was submitted on June 5, 1917. We get a little more relief in the 1920 US Census where Vincent Dreffs is listed and indexed correctly. He can be found living with his wife Rose and their children Stanley, Bennie and Agnes (Aggie). The 1930 US Census throws us another wrench with the listing of William J. Dreffs along with his wife Rose and his children Stanley J, Bennie, Aggie, John, Edward and a boarder named Leo Pinkoski, age 60. The number of years of marriage match for Vincent and Rose. The children’s names match. The ages years match. William is listed as age 37, first married at age 18. His wife Rose is 39, first married at age 20. Nineteen years prior to this census was 1911, the correct year for the wedding of Walter Joseph Dreffs and Rose Tomaski. I’m fairly confident this is our Vincent. I’ve tried hard, but have not been able to locate an obituary or death record for our friend Vincent Dreffs. In fact, I basically lost track of him after 1930 until I found his grave on Find A Grave. The submitter transferred management of the grave to me as I am the closest relative that has come knocking. I would love to fill out the rest of the details. Vincent is buried at Saint Mary Cemetery in Gaylord next to his wife, Rose. I think my next step is to call the cemetery office and see if they have any further information. Good luck in all of your research! If you have any tips for me, I would love to hear from you. Please leave a comment below. You may also wish to check out my Ancestry Family Tree for Vincent Joseph Dreffs.